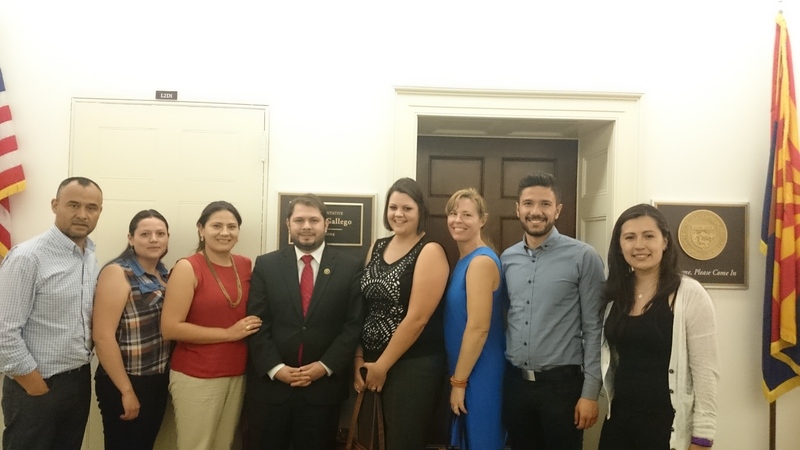 One of MCC’s Colombian partners, JustaPaz, had members meet with Rep. Gallego’s office and other members of Congress last month. In solidarity with the Colombian Mennonite Church, Mennonite Central Committee organizes an annual ecumenical campaign of prayer and advocacy. “Days of Prayer and Action for Colombia” has been a clarion call to pray for those caught in a conflict that tears apart the social fabric of Colombia while encouraging people to take action, recognizing the U.S. government’s role in the conflict. For years the U.S. has funneled large amounts of military aid to the Colombian government as it wages war against guerrilla groups. The largest of these is the Revolutionary Armed Forces of Colombia, or FARC. While the conflict’s roots run deep, the escalation of drug trafficking in Colombia’s rural areas as a way to fund the war garnered much attention from the U.S. Largely untouched by the centralized Colombian government, rural areas were vulnerable to attacks by FARC and prime territory for growing coca, the main ingredient in cocaine. This has left many rural Colombians caught in the crossfire of an escalating drug war. Through the years, campaigns like the Days of Prayer and Action, along with other advocacy efforts, have had moderate success in reducing the amount of military aid the U.S. sends to Colombia. Security Assistance Monitor estimates that military and police aid to Colombia decreased from a peak of $774 million in 2000 to roughly $200 million in 2014. Of equal importance, advocacy has helped encourage a shift in development strategy, recognizing that rural, agrarian reforms are needed to lay the groundwork for a just peace in Colombia. We have reason to be hopeful in this regard. Since 2012, the government of Colombia and FARC have been in peace negotiations in Cuba. Preliminary accords have been signed. These include rural development policies, political participation for the opposition, drug policy reforms and establishing a truth commission. While all are important points, challenges persist in the negotiations. Remaining agenda items include reaching agreement on reparations for victims of the conflict, the details of disarmament, demobilization and reintegration of combatants, and a method for ratifying a final agreement. After almost three years of peace talks and more than a few attempts to broker peace in the recent past, it is understandable that Colombians are not only skeptical but weary. Waiting in hope for a future promise is a heavy burden.
. . . your work produced by faith, your labor prompted by love and your endurance inspired by hope in our Lord Jesus Christ” (1 Thess. 1:2-3). Charissa Zehr is Legislative Associate for International Affairs at the MCC U.S. Washington office. Originally published on August 3, 2015. Reprinted with permission from Mennonite World Review.